The Bacchus Marsh coal project is a coal exploration area held in a 50:50 joint venture between Mantle Mining and Exergen. It is located near the Maddingley mine northwest of Melbourne, in Victoria, Australia. Following the August 2012 announcement of an estimated 1.6 billion tonne inferred resource, the responsibility for the development of the project trasferred under the terms of the joint venture agreement to Exergen. In the joint venture agreement with Mantle, Exergen have undertaken to develop within a $50 million 50 tonnes per hour demonstration plant using the Continuous Hydro-Thermal Dewatering (CHTD) technology. Exergen hav committed to build the proposed plant with a maximum 2-4 year timeframe at a location yet to be confirmed." If it doesn't build the plant within that timetable Mantle has buyback rights on the exploration licence. In late 2012 Exergen announced that it had undertaken a scoping study on a production of 20 million tonnes per annum of final processed product to be shipped to India. The study, undertaken by Exergen investors Theiss and Sedgman, estimated that the plant would cost $2 billion. They claimed that the project would deliver "a Net Present Value of $1.4 billion" on a 25 year mine life. They claimed that the project would employ an average of 900 jobs during construction and 400 permanent jobs at the mine and 90 at an associated Continuous Hydro-Thermal Dewatering (CHTD) plant. The companies also stated that the cost of the demonstration CHTD plant would be $70 million and be located "in the Latrobe Valley." The scoping study itself was not made public. Nor were key economic factors such as estimated exchange rates, global coal prices or carbon prices made explicit. The project proposes to begin open-cut coal mining near Bacchus Marsh. The coal, of low-quality, high moisture content, is proposed to be processed using experimental moisture removal technology. In its initial statement on the project in June 2010, Mantle stated that "based on review of historic holes, including drilled by CRA in the mid 1980’s, Mantle is of the view that EL 5294 could contain an exploration target of between 1 to 2 Billion tonnes of brown coal. Drill logs show that coal quality compares favorably with other coals in Victoria, including the Latrobe Valley, and Western Australia as relates moisture, ash and strip ratio." feed to pipelines or Coal To Liquids (CTL) plants"
In late July 2011 Mantle Mining stated that the area is "area contains a large Exploration Target of brown coal surrounding the Maddingley mine. Mantle executed a Pre-JVA with Exergen Pty Ltd to develop the deposit utilising Exergen’s patented Continuous Hydro-Thermal Dewatering (CHTD) technology. Exergen’s partners include Tata Power, Itochu, Thiess and Sedgman." In a mid-August update Mantle stated that on August 3 a drilling workplan for the project had been approved and that "drill rig mobilization is expected to occur within the next 2 weeks." The company also stated that in relation to the "Joint Venture Agreement, Technology Licence Agreement and Heads of Agreement for Mining" are the subject of discussions which are "actively progressed." In September 2011 an environmentalist chained himself to a test drilling rig that was located eight metres off the ground to protest the Bacchus Marsh coal mine project. The activist, Shaun Murray, of the Switch Off Coal group, said he would not leave until has was removed forcibly. He said he had a group of supporters that were helping him maintain his protest. The activist said he was prepared to be charged with trespass. "There is police here and they've asked me to leave, but I've told them I wouldn't be leaving voluntarily," he said. "I'm prepared to stay here for as long it takes. At the end of the day if I haven't been removed I'll probably call it a day and consider that a good day's work. But I expect the police will call a search and rescue unit and bring a cherry picker to cut me off." "An exploration licence doesn't actually allow you to do anything other than things you might do with hand tools unless you get further approvals," said Doug Sceeny, Director DPI Earth Resources. June 2010: Mantle announced that it had been granted ""priority status over an application for Exploration Licence EL 5294 at the Company’s 100% owned Bacchus Marsh Brown Coal project in Victoria." The company's media release quoted Mantle’s Managing Director, Ian Kraemer as stating that "the addition of Bacchus Marsh will considerably increase Mantle’s exposure to coal as a core element in our portfolio. Mantle’s re-focus on Gold and Coal/CBM projects which hold either defined, JORC compliant resources or, exciting new prospects which, with further exploration, are considered potentially capable of being advanced to JORC compliant resources within a reasonable timeframe, is well advanced." Mantle being licenced to utilise CHTD on its 50% of the coal deposit." finalising the Mine Development Agreement (MDA), within 2 years." commencing construction of Exergen’s Export Project." November 2010: Mantle announces that a "successful drying trial on Bacchus Marsh coal" had been undertaken. The company stated that the highlioghts of the trial were that "hydrothermal treatment performed in Exergen’s bench scale Autoclave (simulates pilot plant performance) in Melbourne" with "subsequent dewatering and pressing to briquette undertaken at Exergen’s pilot plant facility in Beaconsfield,Tasmania,". The company stated that the "Run of Mine (ROM) coal feed moisture content of 47% reduced by over 90% to a briquette moisture content of 5%" and that a "(circa 20 tonne) bulk sample is currently being sourced for full pilot plant trialing." December 9, 2010: Mantle announces that it has "been granted priority status over three (3) additional applications for Coal Exploration Licences at the Company’s 100% owned Bacchus Marsh Coal project in Victoria." The company stated that "EL’s 5323, 5324 and 5325 are located within the Company’s existing EL 5294 application and adjacent to ML 4701 (held by others). Addition of these ELs will consolidate remaining areas in EL 5294 under Mantle control. EL 5294 contains an exploration target between 1 to 2 Billion tonnes of brown coal." "generation of pre-feasibility type intellectual property specific to the Bacchus Marsh coal deposit, location and infrastructure." December 15, 2010: Mantle announces that, based on a re-evaluation of historic drilling data, the company had "a high confidence that the volume of brown coal, at about 1.8 billion tonnes, is at the upper end of the Exploration Target of 1 to 2 billion tonnes". January 11, 2011: Mantle announces that, following discussions with Calleja Industries, the owner/operators of the Maddingly open cut coal mine at Bacchus Marsh, a 20 tonne bulk sample "has been delivered to Exergen’s 4tph pilot plant in Beaconsfield, Tasmania." March 28, 2011: Mantle is granted the exploration licence for the Bacchus Marsh project. March 31, 2011: Mantle announces that a test of a bulk sample from Bacchus Marsh resulted in the moisture content being reduced from 56.7% to 9.5% in the sample briquette. April 7, 2011: Mantle claimed that "an unsubstantiated claim has recently been made by a third party in the public media in relation to the Sulphur (S) levels in Bacchus Marsh brown coal". The company did not state who made the claim, where and when it was made or what the specific claim was beyond stating that "the claim suggests that Bacchus Marsh brown coal contains 3 – 6% S. No (wet or dry) bases, nor official data sources, have been quoted." In response Mantle stated that "the current substantiated knowledge is that the % of S on a dry basis (%db) is 1.74%" but acknowledged that "a number of drill hole logs are available that suggest that higher S levels are concentrated in a number of (selectively minable) layers near the top of seam, thereby eminently blendible." Mantle also provided comparative figurese for other Victorian coals indicating that the Bacchus Marsh deposit compared unfavourably with the Latrobe Valley deposits which ranged between 0.28 and 0.38% but lower than the 2.85% of the Anglesea mine. However, the ash content of the Bacchus Marsh deposit was far higher -- the Latrobe Valley deposits ranged between 1.7% and 3.0% while the Angelsea deposit was 3.8%. 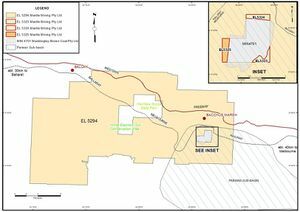 April 18, 2011:Mantle announced that it had been granted three additional exploration licences, ELs 5323, 5324 and 5325, which it described as "infill areas between the Maddingley Coal Mine and Mantle’s surrounding EL 5294." May 30, 2011: Mantle announced that it had selected GHD to advise it on a drillling program for its Bacchus Marsh project. Mantle stated that it was planning on drilling 15 drill holes to complete a 1.6km spaced grid to enable it to develop a JORC standard estimate of the inferred resource. The company stated that 3 holes would be to confirm data from 1960’s & 1980’s drilling and, if those proved successful, drilling a further 12 new in-fill holes to complete the grid. The company stated that it anticipated the drilling would occur in Ausgust or September. June 16, 2011: Mantle announces that it had "entered into an agreement with Intersuisse Limited and its associated corporation, Phillip Capital Pty Ltd, to raise approximately $2,985,690." Of this, 6,153,856 shares would be issued at 9.75 cents per share up to a total of $600,000 for "Sophisticated Investors". The company also stated that "a rights issue which is intended to be underwritten by Intersuisse Limited to raise approximately $2,385,690 by way of a 1:8 non renounceable rights issue of shares with an offer price of 9.75 cents. The anticipated „ex? date for the rights issue is 29 June 2011." July 14, 2011: Mantle releases the prospectus to support its capital raising program. In the prospectus, the total amount sought had been downgraded from $2.38 million to $1.59 million. The closing date for the offer is Wednesday August 17, 2011. The company stated that "the offer will provide a significant capital injection, which will assist with the Company’s existing exploration program, most especially the drill programs at the Bacchus Marsh Coal Project, Granite Castle Gold Project and Barkly Phosphate Project targeted for completion in the 2011 calendar year." The company also stated that funds would be used for "the Trafford Coal Project court case, exploration at the Charters Towers Gold Project and for general working capital purposes." The company stated that $400,000 would be allocated for the Bacchus Marsh Coal Project. July 20, 2011: In its quarterly report Mantle stated that it had raised $600,000 from "Sophisticated Investors". It also stated that or the Bacchus Marsh project the company was undertaking "advanced drill rig contracting, work plan development and landowner liaison." In a later report the company stated that Intersuisse Limited and its associated corporation, Phillip Capital Pty offered the shares to "its sophisticated investor clients". Mantle stated that the funds are "being used to accelerate drilling programs at the drill programs at the Bacchus Marsh Coal Project, Granite Castle Gold Project and Barkly Phosphate Project and for working capital." August 9, 2011: Mantle announces that, as a "consequence of current market conditions", the original closing date of August 17, 2011 for the share issue had been deferred to September 2. The company also stated that "it has received confirmation from Intersuisse Limited, underwriter of the Offer, that termination events have occurred under the Underwriting Agreement as a result of current market conditions. Intersuisse Limited has reserved its rights under the Underwriting Agreement and has not elected to terminate the Underwriting Agreement at this stage. August 11, 2011: In an update on its projects the company stated that "the low impact drilling workplan" for its Bacchus Marsh project "was approved on August 3rd and drill rig mobilization is expected to occur within the next 2 weeks." It also stated that "the Substantive Agreements: Joint Venture Agreement, Technology Licence Agreement and Heads of Agreement for Mining. Draft documentation has been exchanged and discussions are being actively progressed." July 2, 2012: Mantle Mining announces that it has reached agreement with Exergen on a 50:50% joint venture and Technology Licence Deed for the proposed development of Mantle's Bacchus Marsh coal project in Victoria. Mantle stated that under the terms of the agreement Exergen would pay $500,000 representing half of Mantle's costs in conducting its drilling program and defining a JORC-compliant resource. Under the technology agreement, the joint venture would use Exergen's Continuous Hydro-Thermal Dewatering (CHTD) technology with a commercial scale demonstration plant "to be completed within a maximum 2-4 year timeframe at a location yet to be confirmed. Should these timeframes not be met then Mantle has certain buyback rights on the project tenement." The company also stated that once a JORC Inferred Resource base was announced, which was expected "within weeks", Exergen would assume management responsibility for the project. In an August 2012 media release Mantle Mining stated that Exergen had taken over all communications on the project and that Duncan Macfarlane at Crook Publicity would be responsible for all inquiries. ↑ Mantle Mining, "Mantle Reports Maiden JORC Resource", Media Release, August 15, 2012. ↑ Mantle Mining, "Mantle Executes JVA with Exergen", Media Release, July 2, 2012. ↑ Exergen and Mantle Mining, [Bacchus Marsh Project to Deliver jobs windfall: Scoping Study"], Media Release, October 19, 2012. ↑ 4.0 4.1 Mantle Mining, "Large Brown Coal Deposit Application by Mantle"], Media Release, June 17, 2010. ↑ Mantle Mining, "Deans Marsh Update", Mantle Mining, July 28, 2011. ↑ Mantle Mining, "Key Projects Update", Media Release, August 10, 2011. ↑ "I won't budge, coal-mine protester says" Adam Cooper, The Age, September 19, 2011. ↑ "Residents angry about proposed coal exploration", ABC News, September 06 2011. ↑ Mantle Mining, "Large Brown Coal Deposit Application by Mantle", Media Release, June 17, 2010. ↑ 11.0 11.1 11.2 Mantle Mining, "Coal Development MOU Executed", Media Release, August 9, 2010. ↑ Mantle Mining, "Bacchus Marsh Coal Dried Successfully", Media Release, November 30, 2010. ↑ Mantle Mining, "Mantle Applies for Bacchus Marsh Tenements", Media Release, December 9, 2010. ↑ Mantle Mining, "Mantle and Exergen Execute Binding Agreement", Media Release, December 14, 2010. ↑ Mantle Mining, "Bacchus Marsh Exploration Target Update", Media Release, December 15, 2010. ↑ Mantle Mining, "Bacchus Marsh Bulk Sample Update", Media Release, January 11, 2011. ↑ Mantle Mining, "Bacchus Marsh Tenement Granted", Media Release, March 28, 2011. ↑ Mantle Mining, "Pilot Plant Trial a Success", Media Release, March 31, 2011. ↑ Mantle Mining, "Bacchus Marsh Sulphur Levels", Media Release, April 7, 2011. ↑ Mantle Mining, "Bacchus Marsh Tenements Granted", Media Release, April 18, 2011. ↑ Mantle Mining, "Bacchus Marsh Drill Program", Media Release, May 30, 2011. ↑ Mantle Mining, "Capital Raising", Media Release, June 16, 2011. ↑ Mantle Mining, "Entitlement Issue Prospectus", July 14, 2011. ↑ Mantle Mining, "June 2011 Quarterly Activities Report", July 20, 2011. ↑ Mantle Mining, "Notice of General Meeting", August 5, 2011. ↑ Mantle Mining, "Extension of Entitlement Issue", Media Release, August 9, 2011. ↑ Mantle Mining, "Key Projects Update", Media Release, August 9, 2011. ↑ "Exergen and Mantle Mining Finalise Joint Venture Agreement", Media Release, July 2, 2012. ↑ "Mantle Executes JVA with Exergen", Media Release, July 2, 2012. ↑ Mantle Mining, "Bacchus Marsh JV Update", Media Release, August 29, 2012. Ian Kraemer, "Mantle Executes Coal Development MOU - Ian Kraemer, Managing Director", Interview, August 10, 2010. Jon Stanger, "Our neighbour the coal mine?" Ballarat Independent, July 16, 2011. (This post has a collection of audio clips from an interview with Ian Kraemer). Peter Ker, "Market slump damps export plan", Sydney Morning Herald, August 12, 2011. Adam Morton, "Rural residents dig in over coal mine plan", The Age, August 13, 2011. Neelma Choan, "Moorabool mayor denies mining conflict of interest", The Courier (Ballarat), August 22, 2011. Ami Humpage, "Digging in for a fight in Bacchus Marsh", Melton Leader, August 23, 2011. Paul Connor, "Is brown coal really the planet’s saviour? ", Crikey, September 6, 2011. This page was last edited on 4 February 2013, at 03:07.